I have been a bit critical of the online media buys from the new Toyota Prius launch team. There was some really poor content integration with Gawker Media. Thanks, now I get all of these vacuous emails about the day’s celebrity gossip and still not a peep from Toyota about what the point is of my Hybrid Page. Fortunately, the team has released a new content media buy that actually is entertaining, reaches their target and promotes the vehicle effectively. Anything has to be better than their poorly thought out Dictionary.com homepage takeover. 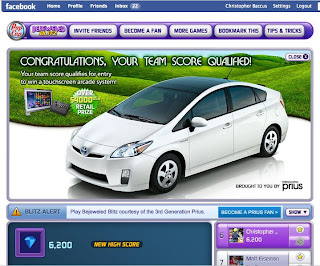 The new Prius buy is a contest on Facebook using the popular online game Bejeweled. I caught the promotion because I was already a fan of the Prius on the social networking site. The game automatically affiliates you with anyone else in your friend network who has granted the game access to their profile. You are then inserted into a team with your “friends” and the team can compete to enter weekly prize giveaways. Unfortunately, after my stellar 9,400 points, the current giveaway is some $4,000 touch screen video game system and not a new Prius. But that doesn’t matter to Toyota as their qualification graphic only gives the arcade prize a 1/8 of screen real-estate while the Prius takes over the rest. Nothing is wrong about this of course, but I sure wish I was entering to win a car instead of video game just being “brought” to me by the Toyota Prius. The game’s application screen also features a couple of buttons for you to “Become a Prius Fan”. This will bring you to the Toyota.com site if you are already a fan of their Facebook page. I couldn’t test it but I’d assume you go to the Prius Facebook page if you are not already a Prius fan. Overall it’s a nice promotion of the car using a game that appeals to women. As a game, Bejeweled tests higher with women than with men and it also is well-known to those in their 30s, which fits well with the hybrid Prius’ target consumer. This is true that Toyota's offer in that marketing effort should be more clear about the prize. I wonder if auto marketers have considered taking some of the elements of a Prius online & TV campaign & push them to the next level? Like for instance what about the commuter's attitude toward driving? What can a clever campaign do to address the fatigue, the work stress, the kids, the husbands, everything that a 30 something woman would face after driving a beautiful new earth freindly car home from a busy day at work...? The Stress Relief and Holistic Health angle have not been fully tapped in Auto branding...and I predict a real visionary can pull it off!